Last Sunday, 1 October 2017, Catalonia held its controversial independence referendum, strongly opposed by the Spanish government but showing the majority of voters (90%) in favor of independence, although with just 42% of voter turnout. And while political analysts are now questioning what will happen next, let us dwell on the major implications of the so-called “Catalexit” for the national and regional economy and for the transport sector in particular. According to year 2016 data, Catalonia accounts for 19% of Spain’s entire GDP and for 25% of the country’s exports. It is the most economically productive and one of the richest regions, being the fourth in terms of GDP per capita (EUR 28,600), after Madrid, Basque Country and Navarra. The average GDP per capita in Spain overall is EUR 24,000. Catalonia has a proven record of attracting investment. In 2015, it attracted 14% of all foreign investment in Spain, by far more than other regions, except Madrid, which received a huge 64%. Its capital Barcelona is home to many large national companies: fashion group Mango, fragrance company Puig, Gas Natural, Spain’s third-largest bank CaixaBank. About a third of all foreign companies have chosen Barcelona as their headquarters in Spain. Thus, for example, Volkswagen and Nissan set up their plants near Barcelona. With the ports of Barcelona and Tarragona, Catalonia is also a major logistics hub. 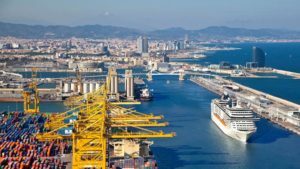 Despite the protracted dockworkers strikes all around Spain this spring, Barcelona handled 39.3 mln tons demonstrating a huge 21.8% increase in its total throughput in January-August 2017. Unlike its rivals – Valencia (+1.44%) and Algeciras (-9%) – Barcelona also showed a tremendous growth in container volumes: +30.2%, up to 1,945,647 TEU in the same period. Earlier this year, we have written about the EUR 75 mln loan from the European Investment Bank allocated for the expansion of ZAL Port (Zona d’Activitats Logístiques), the logistics platform of the Port of Barcelona. ZAL Port plans to construct new logistics and warehousing facilities increasing its capacity up to 1 mln sq.m. ZAL Port is adjacent to BEST (Barcelona Europe South Terminal) container facility of 2.6 mln TEU capacity, developed and operated by Hutchison Port Holdings. The other container handling terminal is APMT Barcelona, former TCB, with another 2.3 mln TEU capacity. So, what will be the impact of the referendum on the ports and logistics infrastructure, on enterprises and foreign business entities, some of which already begin moving their offices to Madrid or other, more stable, Spanish regions? Will Catalonia indeed take the risk of leaving Spain, which means automatically leaving the EU and thus undermining foreign direct investment and raising the export costs of the goods produced in Catalonia? The European Commission already said on Monday that any independent Catalonia would find itself outside the 28-member trading bloc. Amazingly, there is scarce debate in the media on the implications of the Catalan independency on the ports and other transport infrastructure. But apart from the economic issues, there may arise the proprietary questions. If a road, port or airport at the territory of Catalonia was constructed and financed by the state of Spain, the independent Catalonia would need to compensate their value before operating the facility on its own. And some sources reveal that the Government of Catalonia (Generalitat) has already made the evaluations of the infrastructure facilities to be expropriated arriving at the amount of about EUR 100 bln, but who will finance this? As the first sign of this uncertainty, a general strike has been announced today in Catalonia with the idea to protest against the Spanish police’ actions during the Sunday vote. The dockers at the Port of Barcelona have supported the strike, paralyzing the work of the port and forcing some vessels to dock outside. According to the Organization of Dockworkers of Barcelona (Organización de Estibadores Portuarios de Barcelona), the support of the strike was 100%, although the Spanish Transport Ministry (Ministerio de Fomento) reports only 1.5% of the morning shift workers in support. We will follow this process and inform you of further developments.